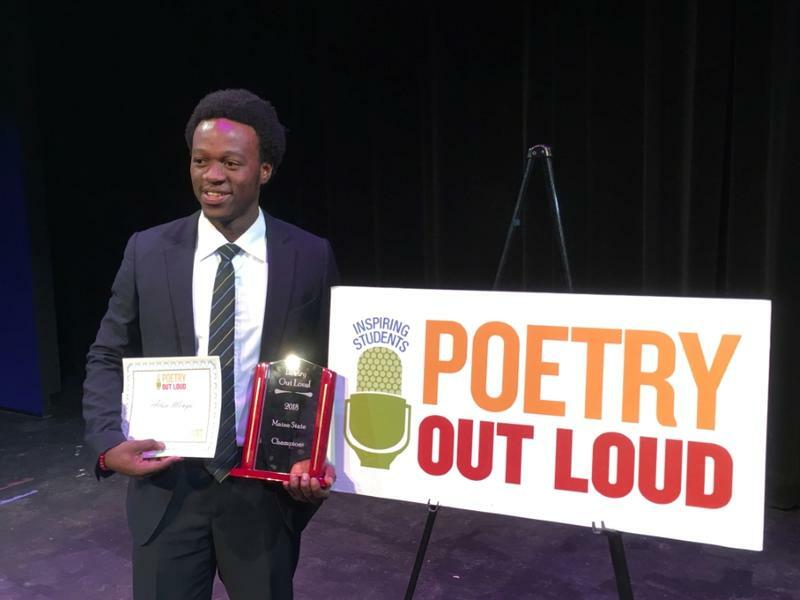 Last month, 19-year-old Deering High School student Allan Monga won Maine's Poetry Out Loud competition, where students memorize and recite poems for cash and prizes. But the National Endowment for the Arts said Monga was ineligible to compete in the national finals because he wasn't classified as a "U.S. citizen or permanent resident." Monga arrived in the United States last summer seeking asylum from Zambia, and he's still pursuing his asylum claim. In response, Monga sued the National Endowment for the Arts last week to allow him to compete in the national finals. He says the eligibility rules are discriminatory toward him and other asylum-seekers. "And if you cannot have them in this competition because they don't have the proper legal status in the U.S., it's just discrimination, in some way," Monga told Maine Public last week. In federal court, lawyers for the National Endowment for the Arts argued that the agency is allowed to "draw a line" when determining eligibility for its programs. The lawyers added that other federal agencies, including the National Science Foundation, have similar eligibility rules. However, on Friday, U.S. District Judge John Woodcock ruled in Monga's favor, saying if Monga missed the national competition, he would lose out on a "unique, fleeting, one-time opportunity he has earned." Woodcock added that the NEA's priorities include "artistic and cultural significance" and said Monga's participation "advances these priorities." After the decision, Monga says he's now busy rehearsing for the finals. Monga says he's working with a local poet and arranging transportation to get to the competition by next week. "I have to put in the extra practice," Monga says. "I just want to go to Washington, D.C. and represent my state in the best way I can." However, the decision is only preliminary. Melissa Hewey, a lawyer representing Monga, says that while the judge's ruling allows him to participate in the national finals, it doesn't make a final determination on whether the NEA must change its rules. Hewey says after Friday's ruling, she hopes the National Endowment will make the change. "Realize that this is a rule that doesn't make sense, as the judge is essentially suggesting," she says. "And withdraw the rule without further litigation." In a statement, a spokesperson for the NEA didn't address if the agency will alter the rules, only saying that the agency "looks forward to welcoming" all of the Poetry Out Loud national finalists. The national competition begins on Monday.